The GUI commands built in to Unity are a fast, convenient way to present information on screen. One way to take full advantage of this is creating GUI elements that line up over 3D objects. In a standard FPS action game, for example, it could show you a monster's health and any effects that are currently active. Add a simple toggle (I prefer the question mark), and you have an easy way to turn on debug information in-game. 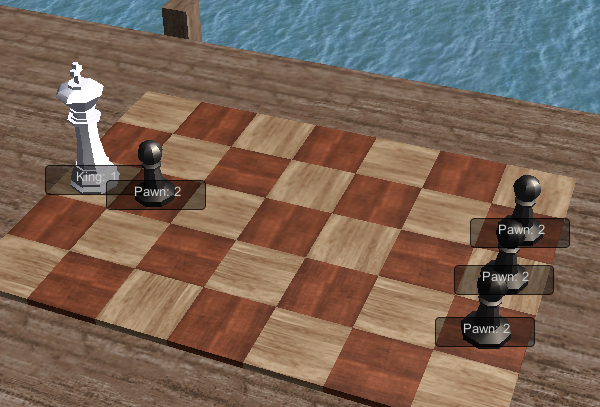 Here's a screenshot from Chess Heroes that shows it in action. What's shown is the type of piece and the ID of the player that owns it. // But in general, this is not a good idea! Hey Ted, I'm fairly new to unity and was attempting to use this script. but I get errors on the "bool" word. Are you using js or C#? Sorry for the late reply, Rick! All of my examples are in C#. Thank you very much, this helped alot! Juice it or lose it! Grand Vision or Foolish Quest?